Facilities management companies are investing in IoT to transform buildings worldwide. Smart devices—from connected lights to sensors embedded in soap dispensers—are providing valuable data that helps facilities management companies not only optimize business operations, but also provide data-based consultation to their clients on space utilization and more. 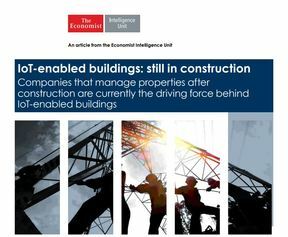 Construction companies can also gain huge efficiencies from using IoT, whether in internal operations or in construction site operations. So who will be the driving force towards IoT-enabled buildings? See perspective in this report by the Economist Intelligence Unit.